This article is the result of an interview with Charity Watson, a Turner syndrome sister who is Helping TS women with hearing support. In 2014, Charity Watson was asked to serve on the 2nd Annual Seeds of Faith Celebration planning committee. It was her first year to serve on the committee and when the team asked, “How can we support TS ladies the most?” Charity was the one to suggest that the Celebration raise funds to provide hearing aids to Turner syndrome ladies. Sensorineural hearing loss affects many young women with TS and worsens with age. This loss can progress to auditory impairment and social disability, including impaired speech or even intellectual development, if they are not diagnosed and treated precociously. Thus, audio logical screening and care are important in both girls and women with TS. According to the SciELO Network, at least 25% of adults with TS have hearing loss that requires hearing aids. With Charity’s recommendation, Leaping Butterfly Ministry has now supplied over 20 hearing aids since the scholarship effort began with her suggestion. 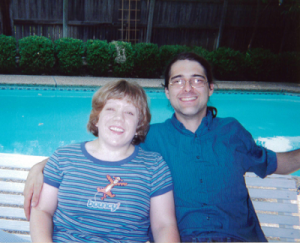 Since December 2012, Charity and her husband, Roger, have lived in the Houston area. They moved here after graduating from Oklahoma State and Roger getting his first job in Houston. After they moved here they adopted their first rescue dog, Cameron, a miniature Dachshund. 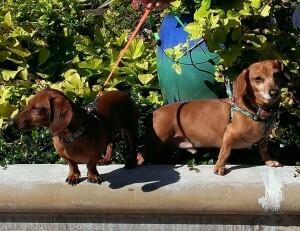 A year and half later, they adopted another rescue dog, Riley, who is also miniature Dachshund. Roger and Charity initially met through a blind date setup. After teaching Spanish for one year in Dallas, Charity moved back to Tulsa and taught English as a second language. After that, she decided to take a break from teaching. She was searching for a new job and started working at the local Bennigan’s restaurant as a host. A co-worker in her early 20s mentioned that she should meet her roommate. The co-worker lived with her mom, plus her husband’s best friend lived there; it was a full house! Charity was very suspicious when the co-worker asked in the morning if she was seeing anyone. Normally, Charity says she would have never agreed to a meet-up; but, for a change, she decided to be open to meeting him. Roger was very shy. After co-worker’s shift was up, she called Roger and he said he wanted me to come over to the house to meet him. Charity went over, hang out and played cards. They were both hungry; Roger and Charity then went out dinner and went bowling. Ever since, they’ve been joined at the hip. 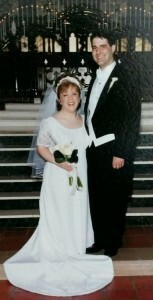 A year and a half later, they were married on March 20, 2004 in her home church, First United Methodist in downtown Tulsa, where Charity had been a member since she was five years old. They had a relatively simple and elegant ceremony; it wasn’t extravagant. Charity was born in Tulsa, Oklahoma and has one sister, Emily, who is two years older than her. Charity’s dad is retired now after working 40 years as an engineer. He worked the longest for Benham, leaving and coming back there repeatedly. When Charity was in kindergarten, her mom started back to work part-time. She was working full-time again by the time Charity was in first grade. For more than 25 years, her mom was a social worker. She also did some work in music therapy. Right after Roger and Charity’s first date, Charity started working, like her mom, as a social worker. She worked for 10 years with the Department of Human Services in Stillwater, Oklahoma, in the downtown areas of Tulsa. “I enjoyed working with families, helping them apply for the title 19 Medicaid and title subsidized day care plus food stamps program,” Charity says. “I would interview them and determine if they were eligible for benefits. It was a very emotionally and mentally challenging position; it’s not for the faint of heart.” The state’s day care assistance program worked more like insurance coverage. Families would have a co-pay for services and then pay no out of pocket for additional childcare services. 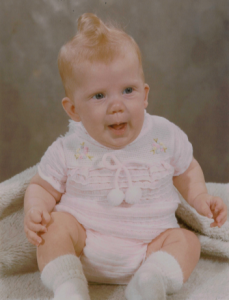 In March, 1977, Charity was diagnosed with Turner syndrome when she was 13 months old. She was very fortunate to have been diagnosed so early in the ’70s, a time when very little was known about TS. Her mom was taking her in for her well baby checkups and the pediatrician noticed that Charity was falling off the growth charts. This doctor was a veteran and new to be suspicious about her short stature. However, most of her family was short. Her dad was only 5’10, her mom was 5’2, her gradmas was 4’8, and her aunt and a cousin were 5 foot. So, it was surprising that the doctor picked up on her growth issue so early, especially since she was perfectly healthy in every other way. But, the pediatrician insisted on giving her a Karyotype Test to determine her chromosome count. A karyotype is a blood test that produces an image of your chromosomes. And, his concerns were confirmed; she had Turner syndrome. Charity also learned that she had repeated hearing issues from an early age, but her doctors had not noticed. She has a high pain tolerance and never cried a lot or pulled on her ears when she was little. In fact, her grandparents encouraged her mom to have her ears checked out when she was 3 years old. She wasn’t responding well to her name and was only using two or three word phases. Her grandparents had noticed that her language development was not correct for her age. She saw an ear, nose and throat doctor and he confirmed that she had signs of multiple ear infections, most likely since birth. The fluid wasn’t draining in her ears; so, she had tubes put in her ears when she was four years old and then again when she was 5. The tubes helped; but, she still had ear infections throughout her childhood. She was 12 before she outgrew the infections and got some relief. After the tubes were removed from her ears (around the time she went into first grade), the holes where the tubes used to be didn’t heal correctly. Charity had to have her ear drums repaired to close up the holes. Since 5 years old, she had multiple sets of hearing aids, getting a new set every few years. She’s probably had 15-20 sets of hearing aids to date. When she was around 6 years old, she had her first heart issue, an issue with her bicusped aeortic valve. This issue, which one of the top 3 heart issues for TS females, was discovered while she was participating in a growth hormone study (a study she participated in from age 5 to 17). The endocrinologist that associated with the study most likely discovered her heart issue when she was 6. It wasn’t until after she was married that she found out that she had an aortic aneurysm. Charity had went to a neurologist because she was having migraines. After looking at her medical history, the neurologist said she couldn’t leave his office until she had made an appointment with a cardiologist. She started getting echocardiograms every year once she saw the cardiologist. A year and a half ago, she had open heart surgery to address the aneurysm. Charity is doing well now after the surgery; however, the first six months of her recovery were rocky. She’s now at 100%! She will still have to have an echocardiogram and CT scan every year and keep monitoring her heart going forward. She’s hopeful that she won’t have any surgery on her heart in the future. “I can maintain an active lifestyle and do most anything I want,” Charity says. “If I feel up to it, I can do it. But, I probably won’t become a cross fit athlete or a body builder.” Charity giggles. Charity graduated from the University of Oklahoma in July 1999. Originally planning to be a Spanish teacher, Charity focused primarily on her passion: language. She was fortunate to study abroad in Guadalajera, Mexico in the fall of 1996. After graduation, she student taught in the Fall of 1999 in Norman, Oklahoma. She then took some time off and worked at Steinmart until May, 2000. She got her first teaching job in Dallas in the Carrollton/Farmer’s Branch area. She was a freshman Spanish teacher at Creekview High School. After a year of teaching, she got homesick, wanted a stronger support system and decided to move back near family and friends to Tulsa. She was able to get a teaching job at middle school at Clinton Middle School for the 2001-2001 school year; however, it wasn’t as a Spanish teacher. Instead, she was thrown into a new English as a Second Language (ESL) program with no materials or support. It was up to her to put the curriculum together. That year of teaching was really tough. She had 16 kids all day, every day in an old conference room that was half the size of a regular class. After such a challenging year, she re-thought working with teenagers and took a step away from teaching. In September, 2002, while looking for a job, she started working at Bennigan’s and met Roger. After a few months of working at the restaurant, she got a social worker position at the Department of Human Services. After 10 years of service, she left this position in May, 2012. In July 2012, Charity became a social worker at Community Development Support Association (CDSA). This organization helps client improve their education and skills so they can get a job at within an in-demand occupation. Sponsored by the Workforce Investment Act, this group truly helps people learn and start working in new fields. After a couple of years of marriage, Roger went back to school at Oklahoma State and graduated with an electrical engineering degree in December 2012. After graduation, he got a job offer in Sugar Land with Yokogawa America and started working there in January, 2013. Roger helps design safety control systems for offshore oil rigs. Over the last 5 years in Houston, Charity has had two retail jobs. After recovering from heart surgery, Charity is now in the early stages of looking for a full-time job. She hopes to still be in customer service and helping people, but not necessarily in social work. She’s open to working for a non-profit organization and would like to be able to use her bilingual skills. She is looking for the right opportunity. She loves to travel and hopes to see one of her top destinations soon: Ireland, Greece, Spain, Italy, and more. There’s so many other locations on her bucket list! Charity will also serve on the 2019 Seeds of Faith Celebration committee, planning next year’s fundraising event at the Briar Club in Houston. This event is one of the major fundraising events held each year to raise even more funds for hearing aid scholarships.